Pushing the boundaries of offshore windfarm construction. 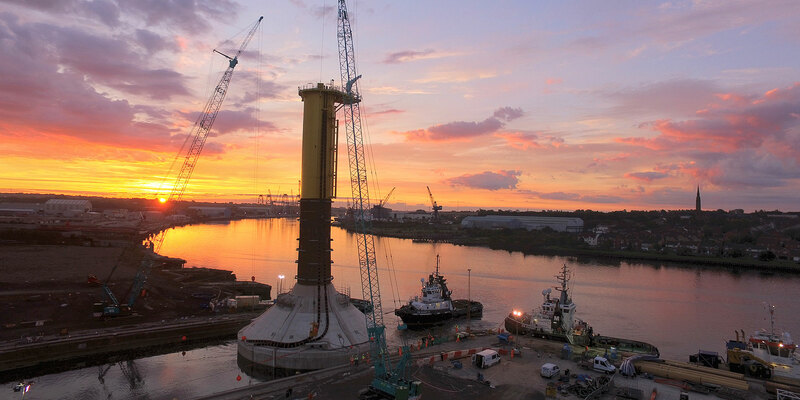 The EDF Renewables Blyth Offshore Demonstrator Windfarm Project is for the design and construction of five 8.3MW wind turbine generators located 5km off the Northumberland coast in approximately 40m water depth. These are the world’s largest foundations and are pushing the civil engineering boundaries in offshore structures. BAM has used several different innovative techniques and methods of construction to produce five ground-breaking Gravity-Base Foundations (GBF). This pioneering design is the first time the specialist “float and submerge” method has been successfully used on an offshore windfarm. The GBF is a hollow base constructed on land then floated out to sea and submerged to its final location. They are then ballasted with sand so that wind turbine loads can be placed upon it. This method negates piling out at sea. Construction of these ground-breaking structures will lead the way to more cost- effective renewable energy solutions worldwide. Each GBF weighs 7,500t when floated. Once ballasted with sand, the GBFs provide stable foundations on the seabed and weigh a staggering 22,300t each. There were no requirements for piling, heavy lift or jack up vessels during the entire operation. After the 25 year lifespan of the foundations, the sand can be removed and the GBFs re-floated and towed back to land for demolition. BAM’s core objectives for this innovative method was to develop a design that was compact and lean and to provide an economical solution for the offshore wind power industry. During the construction phase, there was constant monitoring of surface water runoff to ensure no contaminants were filtering into the River Tyne. The concrete washout area was contained at the far end of the site with no direct route to the river. The roof panels were precast on site which eliminated the need for an expensive, timely transportation process. Lean awareness training was provided to staff to reduce the wasteful managing of activities and reduce task time but maintain high quality. BAM successfully reduced the time spent on tasks by half over the course of the five GBF. The project engaged with the community in a variety of ways by supplying a local young adult’s church group with equipment and training to help with their trip to Mexico to build houses for the less fortunate. The site team supported the Wallsend Historical Society. An open day at the site was held for both families and local people attending. Throughout the project, the chosen charity was MIND where approximately £5,000 was raised through a range of activities. Local suppliers, workforce and apprentices were sourced for the construction of the GBF’s along with “fruity Wednesdays” where free fruit was delivered and available to the whole site from a local grocer. These structures are special because of the different phases in their life cycle. The structure is constructed on land but then “floated” so the design has to accommodate floating stability. The structure then becomes a submarine as we submerge the GBF onto the seabed in a controlled immersion process. Ballast sand is pumped into the GBF to allow the structure to withstand the loads from the turbines. Finally, the processes can be reversed at the de-commissioning stage and the structure brought back to land to allow the site to be re-used and materials recycled after a 25-year lifespan.